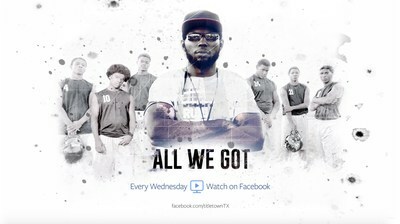 All We Got tells the story of a group of incarcerated teenagers who have failed in less restrictive facilities and the mentors who offer them a chance at redemption through discipline, encouragement and high school football. The series examines the troubled pasts of several students, the challenges of fielding a competitive team in a correctional facility, the discrimination the team endures from opposing schools and the first-year head coach whose goal is to guide them away from living lives of crime. New episodes of the series will post every Wednesday on Facebook Watch, The Fort Worth Star-Telegramwebsite, and YouTube. The first season will also be available on Amazon's Prime Video Direct platform. "All We Got adds another unique chapter to our series about football and the culture surrounding it in Texas," said Director of Editorial Video, Jonathan Forsythe. "Our producers gained exclusive access to the facility to tell the personal stories of teens who were trying to redeem their lives through football, and the dedicated Texas Juvenile Justice Department staff motivated to help them." As a dynamic component to the series, McClatchy Studios and McClatchy New Ventures Lab co-produced a cinematic virtual reality piece that places viewers inside the game day experience through the perspectives of two very different high school athletes -- simultaneously. From the moment they wake up until they set foot on the field, viewers are immersed in a 360° split screen environment, looking left to observe the life of a Gainesville student and looking right to observe a student from an opposing school. The story culminates with the team captains meeting at midfield for the coin toss. The experience features stereoscopic 360° video and spatial audio. The All We Got, VR piece is available for virtual reality headsets through YouTubeVR. It will also be posted soon on the Titletown, TX Facebook Watch page. All We Got is the third installment of the five-time Emmy-winning Titletown, TX documentary series. The first season premiered in August 2016 and provided an inside account of an elite Texas high school football team's journey for a sixth state championship in eight years. The second season documented the Texas Wesleyan Rams' rebuilding of a football program after a 75-year hiatus. The first two seasons are available on Facebook Watch, YouTube and the Star-Telegramwebsite. Follow Titletown, TX on Instagram (@titletowntx) and Twitter (@titletowntx). McClatchy Studios is the documentary production arm of McClatchy and is dedicated to revelatory nonfiction storytelling driven by local characters with national appeal. It taps into the rich, on-the-ground reporting by its team of of multimedia journalists based in local communities across the U.S. and packages it in formats that engage audiences on a variety of platforms. McClatchy Studios finds compelling ways to embrace everything storytelling can be — inspiring, motivating and entertaining. The Fort Worth Star was founded in 1906 and merged with the Fort Worth Telegram in 1909 to become the Fort Worth Star-Telegram. Throughout its history, the Star-Telegram has been recognized for innovation and public service. In 1922, the paper began the first Fort Worth radio station, WBAP, "We Bring a Program." It also established the first television station in the southern half of the United States in 1948. In the 1980s, the Star-Telegram founded "Star-Text" -- the oldest continually operating online news service in the country. The Star-Telegram has won two Pulitzer Prizes. The first, in 1981, was for photographer Larry Price's photos of Liberian officials being killed by a firing squad. The second was the coveted gold medal Pulitzer for meritorious public service in 1985. That year, the Star-Telegram received recognition for a series that exposed a flaw in Bell helicopters that was a factor in numerous crashes over a 17-year period.